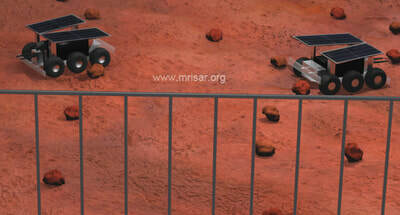 This exhibit consists of two Probe Robots with Remote Control, Video Link and Specimen Retrieval. 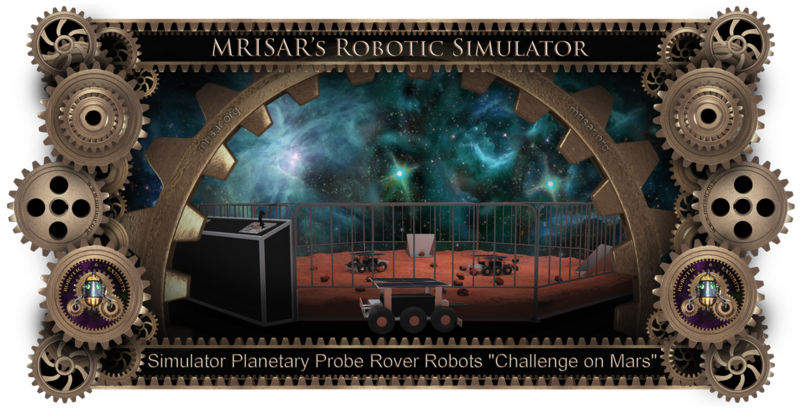 Planetary rover exploration race activity: You are on a mission to explore the planet of Mars! Your job is to use a rover to find samples. Your opponent is a fellow researcher. Find and secure more samples than the other researcher and you will be promoted to mission commander. 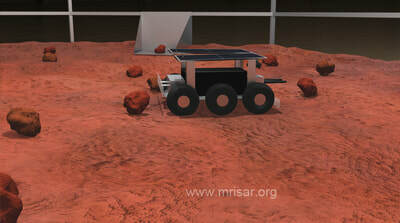 The rovers are remotely operated via two control panels. The control panels afford the use of the rovers and also a rover’s eye view of the exploration via a miniature camera and monitor system. 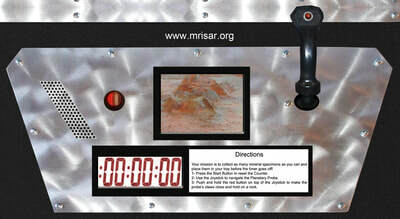 The control panels keep track of available time left for exploration, the number of items found and retrieved and the opponents score. Each rover is equipped with a robot hand that can be used to grasp objects found on the terrain. The objects are then taken to a collection point. When the time expires for the exploration challenge, the objects are automatically randomly returned to the terrain by the collection devices which catapult the objects onto the terrain. 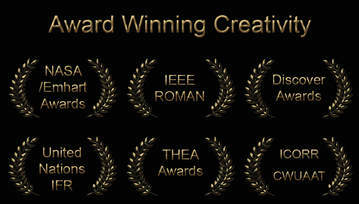 These objects are made of soft materials and the collection device disperses the objects only within the terrain area. 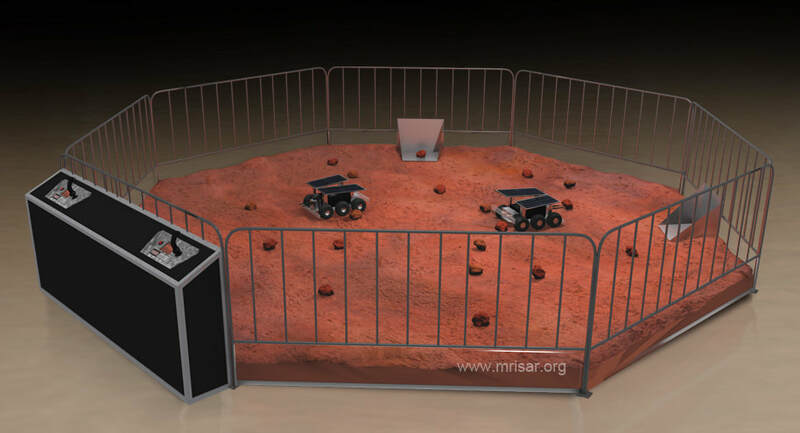 The goal of this exhibit is to familiarize the user with robotic manipulation in a planetary exploration environment, the basic elements of the robotic technology, and the relationship that even very complicated equipment has to the basis of “simple machines”. The telepresence operation setup for robotics also specifically relates to actual workstations in space and industry. As with all of our robotics exhibits this exhibit also conveys a wide variety of elements that are important to STEM education. Technical basics: Runtime is no less than one day between charges. Radio control is to be set to different frequencies and codes for the rovers so that they can operate together without interference. The control panel features a message repeater that reads the directions and also relates some of the status details of the exploration. The control panel digital readouts show the status of the activity progress, time left and opponent’s progress. Please note that this exhibit is usable by either one or two people at a time. The frame of the exhibit is aluminum railings with clear poly-carbonate to make it visible from all sides and to create a see through enclosure. Purchase includes complete exhibit including Activity terrain and railing, two (2) Rovers, two (2) control panels, items to find, collection devices, battery chargers for probes, manuals, control panel mounting case, a set of basic repair tools and a set of replacement drive motors for rovers and for the resetting devices. The exhibit terrain area is 16' diameter. 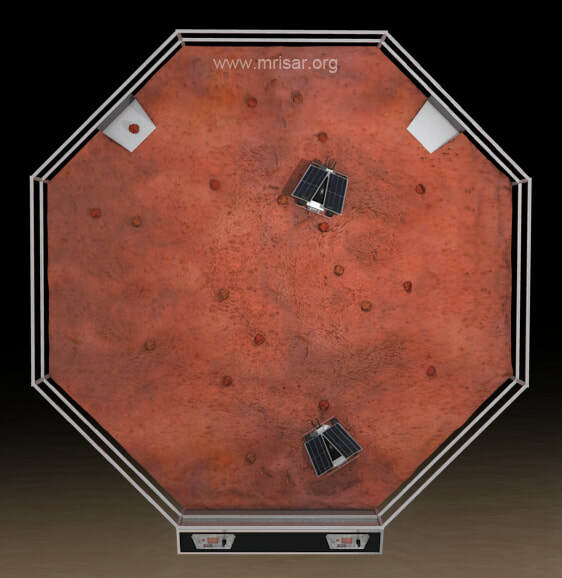 Each probe rover is 8” high x 18” long. Additional Purchase Option: "A Spare Rover": One (1) Spare probe rover with chargers. Contact us for a fabrication timeline.